Irvine Classical Players Perform "Peter and the Wolf" at Chuck Jones Center for Creativity! 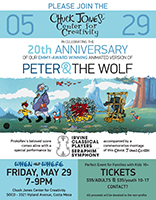 BUY TICKETS HERE!Please join the Chuck Jones Center for Creativity as we celebrate the 20th Anniversary of the Emmy Award-winning, “Peter and the Wolf”. Enjoy an evening’s recital with the Irvine Classical Players and the Seraphim Symphony in this fundraising benefit for the Center and these fine Orange County musicians. All proceeds will benefit the non-profits. This musical evening will take place Friday, May 29, from 7 to 9 PM at the Center, 3321 Hyland Avenue, Costa Mesa, CA 92626. Tickets are available by clicking on this sentence. “Peter and the Wolf” was originally commissioned in 1936 by the Central Children’s Theater in Moscow with the intent to engage young people at an early age with a love of classical music; Prokofiev finished the work in just four days. In 1995 Chuck’s character designs became the basis for an live action/animated TV special written, produced, and directed by George Daugherty, that starred Lloyd Bridges and Kirstie Alley. It won an Emmy the following year for best children’s television special. The Center is pleased to partner with Irvine Classical Players and Seraphim Symphony to bring you this selection of music from this musical masterpiece. Please join us! Tickets are available by clicking on this sentence. A special thank you to Warner Bros. for allowing us to use their Looney Tunes characters in our programs.